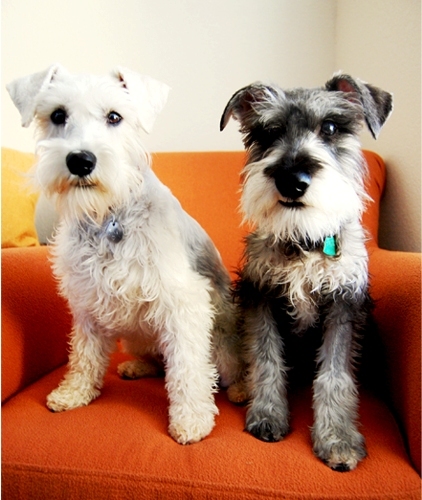 One of my blog buddies are the lovable Yuki and Rocket who are both adorable Schnauzers. I have now grown an affinity to the breed that I've researched some points that make them special. Aside from watching Dogs 101, here are some facts I've also picked up about the breed. These guys are Yuki (Whitey on the Left) and Rocket (Gray Toto on the Right). Their mom was nice enough to have allowed me to show their cute adorable teen picture. They're a little old and mature now, so if you're interested in visiting their site just click HERE. 1. They came from Germany ( and it's pretty obvious from the name Schnauzer). 2. Their original job description was to catch rats in farms. 3. They have a standard height of 12-14 inches. 4. Schnauzers belong to the Terrier family. 5. Both male and female are gentle, loving and great as family pets. 6. Both genders have little difference in weight and height. 7. They're very protective of their homes- loves to bark. 8. Easy to train and are considered a smart and curious breed. 9. Shedding is minimal but due to its long beard at front, they need constant grooming. 10. They have a lifespan of 10-14 years but others have lived longer. 11. Great with children and great with walking to meet "girls". 12. Their fur color varies from black, black and silver or salt and pepper. 13. Are generally healthy although some can have inherited diseases such as Schnauzer Bumps. I believe Rocket had a Schnauzer bump growing on his arm. Although it doesn't greatly affect the dog, it does the owner. Either way, it's always best to have it checked and removed. Yuki is a white Schnauzer, her fur color wasn't listed on number 12 because she's special. To know more about white Schnauzers, just visit this link. Watch out for more about Dachshunds. Let's hope Nola will share her pretty pictures with us, too. Edit: Thanks for telling us in advance, Nola. I'll be posting it soon. I apologize for changing the title of this post. I think the newest one makes better sense than "13 Reasons to Choose a Schnauzer". I understand from my Human that she almost got a Schnauzer instead of me. Papa nixed the idea...he wanted another retriever...so here I am! Oh I love Schnauzers! I live near one, we're great friends! Of course I'll share my pics with you. If you put something about colors, could you say I'm a sable? My mom gets asked all the time if I'm a Dachshund or not, cause of my coloring. We are big Yuki and Rocket fans ourselves and we came over to say hi because they told us about your blog. Glad to meet you! @Hawky: It's amazing how your Dad was able to convince your mom to choose a CBR. The size alone is a large deviation. I'm sure they didn't regret choosing you. @Y&R: I see. Sorry about that, I read about Hysto...watchamacalit in your post but it didn't stick to my mind. Thanks for correcting me. @Carolyn: Lol, I believe you should ask Austin before getting a Schnauzer. They are pretty little beings, aren't they. By the way, did you know that when a dog is made to live with a cat, the pack leader is usually the cat? @Nola: Hmmm, all I know about Dachs are that they're cute and weiner-types. They're also energetic. Let me get back to you on that sable question later. @Tucker: Hi, it's great of you to come by. You're a Chinese Crested, right? I haven't seen one where I live. I hope you can come by from visit time to time. Hey Magic, thanks for dropping by. Schnauzers are one of the oh-so -cute breeds. But I'm not sure how well you guys can deal with really hot weather. Here in the Philippines, sometimes the temperature can reach up to 36 degrees Celsius. And we don't have air conditioning at home, so that's why it's a somewhat a little rare for middle class people to own one. And thank you for commenting. I can't wait to check your brother and sisters. Sweet! Stopping by from Yuki and Rocket's blog. I am a Mini and I live with my people and my fur-brother Theo in South Alabama, USA and it is very hot here. We do pretty well as long as we can get to water! Thanks for the info, we just got a 3 months Schnauzer,and we are very happy to have her. My kids are exited as well and we are anxious to learn more about her.